Yesterday I said I would put up another post later in the day, and I just never got to it. I have about 5 different projects all going on right now, and we've had lots of friends over recently, so life just keeps moving! I'm showing great restraint in not posting everything that I *could* today.....I just need to stretch it in to other posts later this week. One of those posts being about our living room, and my constant frustration over not getting this room "right". Anyway, I'm going to move onto the positive, and show you what I do like that is going on in this room right now!! Late in August, I had my friend Janna over to help me re stage the living room. After moving some furniture around, we agreed that the sofa needed a side table. On one of my Goodwill trips, I found this! $7.99. It was the perfect size, but the paint on it was horrendous. The top surface was all crackled paint- and not a chippy paint cute kinda way. As in, total messed up paint job. The legs were fine, and I thought about leaving them as is, but since everything in the living room is so light I didn't think that much black would work. I almost never use stripper on my furniture. I hate using it, and so typically the sander is all I need. But the sander wasn't taking off enough of the paint (see above), so I relented and got some Citristrip. Whatever the red paint was, was a NIGHTMARE. Imagine someone smearing red lipstick all over it and then attempting to strip it off, and you pretty much have the idea. It never would come off, it just smeared more and more. I set it aside for a couple weeks and let the junk dry and then went at it again with heavy grit sandpaper. It got most of it off, but I just decided to work with it. You can see the results. I really like seeing the layers and the bits of black that still show. 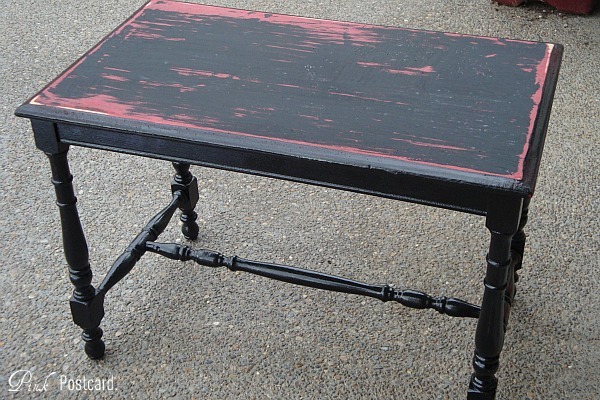 I applied a glossy stain and painted the top with black milk paint. 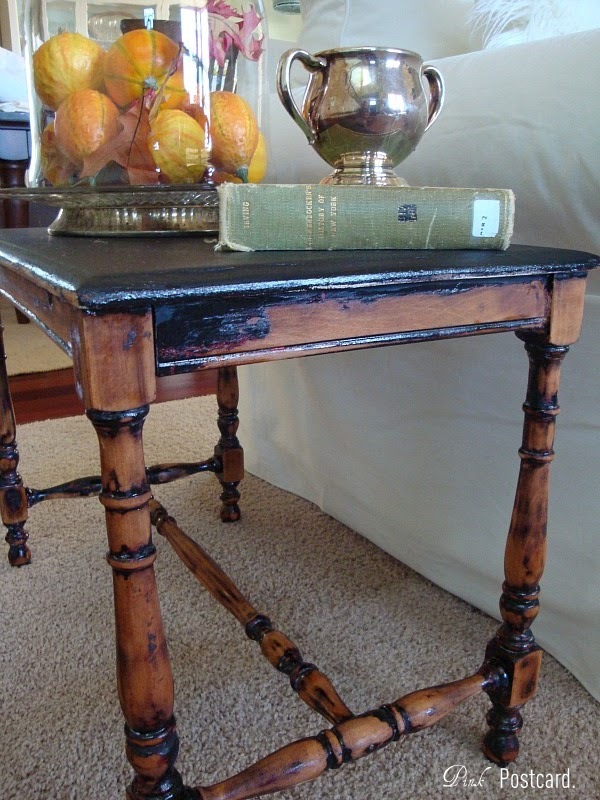 I think it adds a bit of character to this piece now, and like I always say, every room needs a touch of black! Another part of the living room (entry way?) that has been bugging me, is our bench. Working with the slanted wall has always been a challenge with the art. I finally found something I really love. 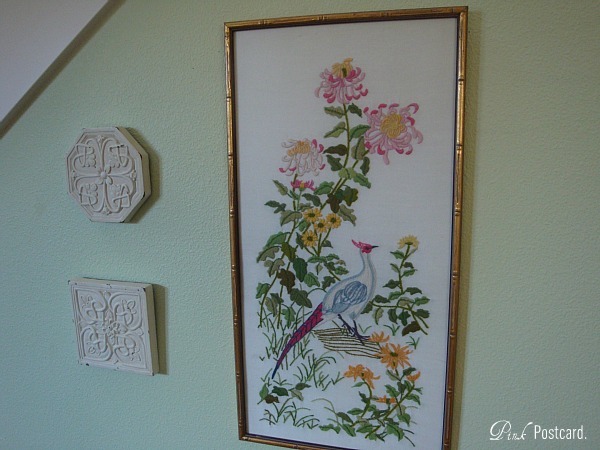 The embroidered wall art with gold bamboo frame was another Goodwill find. $6.99! The colors are a perfect match to the room, and I love that adds a worldly / vintage flair. The only thing missing from this now is a pillow. 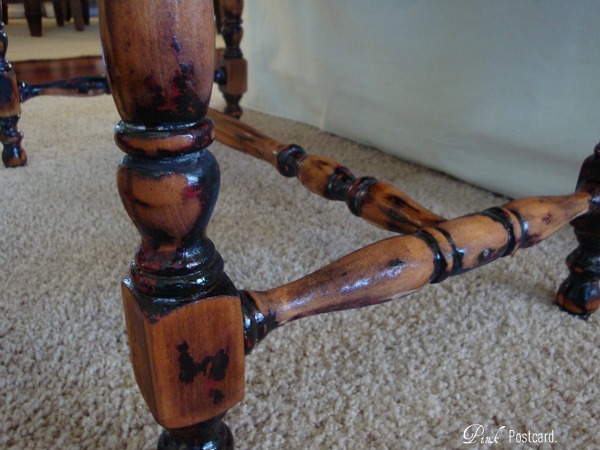 I plan to make a long skinny one to go on the middle of the bench. Love this!! The little plaques are a nice neutral and textural addition. They were something I got at a Southern Living party several years ago. At least I have a couple things that I really like in this room now! 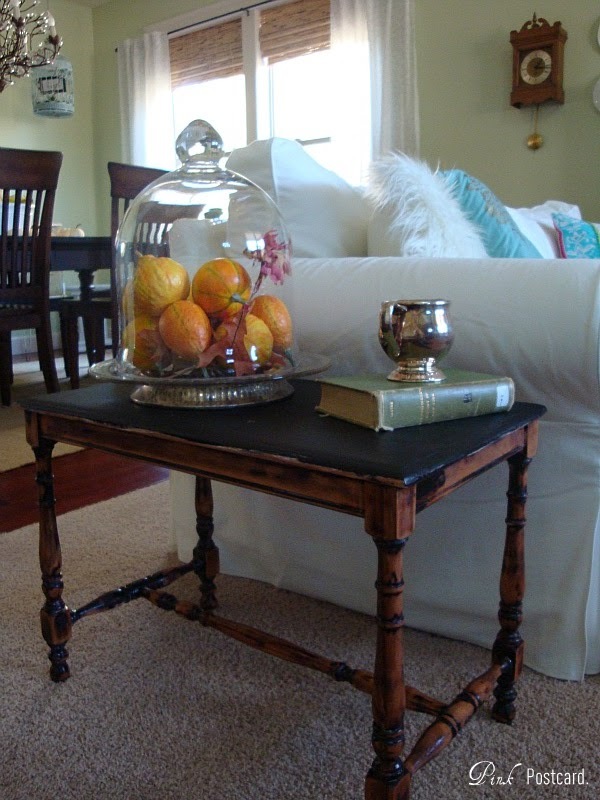 I think your table looks great and what a great price :) Gold is making a comeback and your frame is fabulous! The bench and art are a perfect fit for the space. I know what you mean about not being able to get a room "right". I am stuck trying to arrange furniture in our living room from our old house (7 yrs ago) and there is no way to make it quite right. For now it will just have to do. Hi Denise, I'm new to your blog and have enjoyed being a "looky-loo". 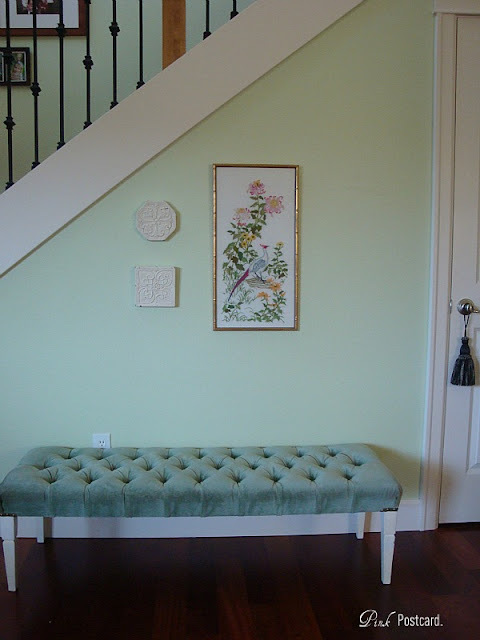 Your new tufted bench is so pretty. I would love to find something like that! 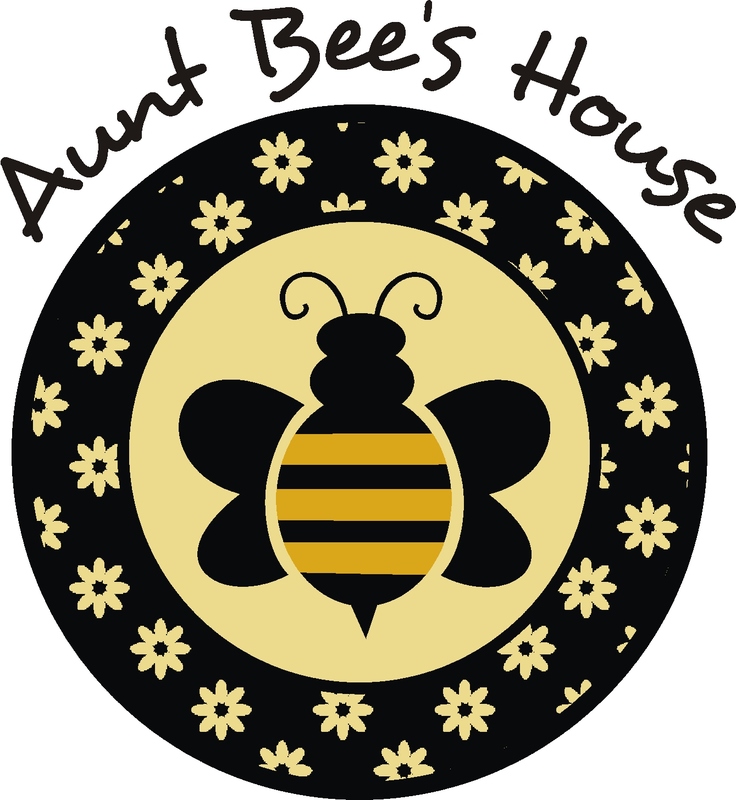 If you would ever like to share one of your projects, I have a link party that starts on Tuesdays. I'd love for you to join.